Shippers and logistics providers want a simple, one-stop shop for intermodal solutions. RailDex connects your ramp service with your drayage rates so you can offer a comprehensive door-to-door solution with minimal effort and reach new industry verticals that wouldn't otherwise be accessible. 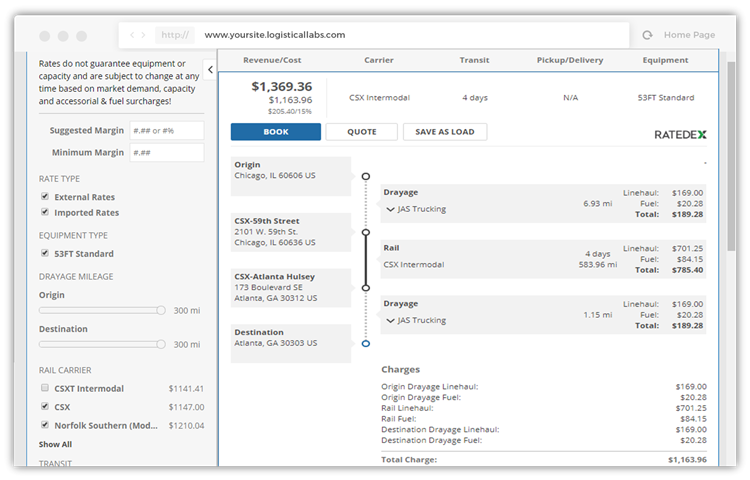 Aggregate millions of permutations of drayage, door-to-door, and ramp rates into a single integrated, easy-to-use platform. Optimize intermodal routes, create tariffs, and calculate customer-specific pricing. Offer a complete door-to-door solution with minimal effort, and grow your customer base with API connections. Don't get buried in intermodal data or stuck with a limited customer base. Find out to get your door-to-door product out to potential buyers more effectively.